"Decades After Racial Strife, Returning to A&M" was first published by The Texas Tribune, a nonprofit, nonpartisan media organization that informs Texans — and engages with them — about public policy, politics, government and statewide issues. Two decades after becoming the first black student at Texas A&M to spend four years in the school's Corps of Cadets, Bill Mahomes received a call from an old classmate. They hadn’t spoken since graduation, but the man wanted to apologize. He had screamed at Mahomes once – not uncommon in A&M’s massive, ROTC-like military program. But this instance had crossed the line. Words were too harsh. Racial slurs may have been used. The incident had weighed on the classmate ever since. Mahomes listened to the apology but didn’t know what to say. At first, he couldn’t even remember the incident. That kind of thing happened so often at A&M in the 1960s that he usually endured it and moved on. The apology, however, left a more lasting impression. Looking back, the 68-year-old lawyer says, it was one of many healing moments that helped him reconnect with his university — a school he kept his distance from after graduating during the painful civil rights era. He began to be reminded of times of personal triumph and togetherness. And he came to realize that the strict rules and hard living of the A&M Corps were responsible for much of his professional success. Now, 46 years after graduating, Mahomes is connected to the school in a way he never thought possible: He helps run it. This year, Gov. Greg Abbott appointed him to the A&M System Board of Regents, a far cry from his difficult days on campus. “It has just been a dream,” Mahomes said. It may have been naïve, but Mahomes showed up on the A&M campus in 1965 thinking he'd have no problems. The university was in the middle of transforming from a small-town agricultural college to a major research institute. It was known for its rigid conservatism, but it didn’t have a reputation for civil rights strife. Mahomes had seen reports from across the south of universities resisting integration. But there had hardly been a peep out of A&M when three black students enrolled in summer classes in 1963. A&M’s military culture simply didn’t tolerate protests – for or against integration. That much was clear to Mahomes when he arrived. Early in his studies, a group of stern-faced upperclassmen pulled him into a dorm room and demanded to know which civil rights group he represented. “Who sent you here?” one student asked. The older cadets paused, and then one laughed. “If the civil rights folks were going to plant someone here at A&M, they sure wouldn’t have picked [Mahomes],” the cadet said. That much was true. Prior to arriving at A&M, Mahomes’ experience with racial tension was mostly systemic, not personal. He grew up in the small East Texas town of Lindale and attended segregated schools. There were restaurants where he couldn’t dine and parts of town he didn’t visit, but he almost never interacted with white people, so he rarely felt any resentment. Many of the white A&M students in those years were in the same situation. “Unless you came from up north, pretty much all the students came from the segregated school system,” said Bill Youngkin, one of Mahomes’ classmates. Mahomes’ real reasons for picking A&M were more practical than ideological. He liked that the Corps provided free uniforms, meaning his parents wouldn't have to spend their limited money on his clothes. And the school’s ballyhooed “core values” of “loyalty, integrity, excellence, leadership, respect and selfless service” reminded him of his time in the Boy Scouts. Another plus: There were hardly any girls at A&M. Mahomes was shy and spoke with a severe stutter, so women were a nerve-racking distraction he preferred to live without. The university had only begun accepting women in 1963, and few had taken the opportunity to enroll. Mahomes soon learned the same was true of black students. In 1965, there were only a handful in the Corps. He was the only one of that group to make it to his senior year. Texas A&M System Regent Bill Mahomes as a student in the 1960s. Mahomes quickly realized how different his new home was. He heard students use racial slurs on campus. Occasionally, they were directed at him or other black students in a venomous way; more often they came up in casual conversation. Racial tensions periodically flared. During Mahomes’ freshman year, football coach Gene Stallings publicly refused to recruit black players, saying it would divide his team. Near the end of Mahomes’ senior year, a group of black students wrote an open letter to school president and World War II hero Earl Rudder, saying they felt “morally maimed and mentally tormented” on campus. The letter ended with a list of demands, including a counselor for black students and a more accurate representation of black people in history courses. The board of regents refused. Mahomes mostly avoided those conflicts. He was more focused on surviving the Corps. The tradition-laden group was close-knit, but tough on its younger members. That was especially true for Mahomes. Each freshman was required to memorize the names of all the Corps upperclassmen. If he forgot, he would be forced to endure physical tests. At night, freshmen could be wrestled from bed and ordered to run around campus or do push-ups in the mud. It was a struggle that all freshmen shared, but Mahomes got it worse. The best way to survive was to stay anonymous – and that was hard for a black student with a stutter. “All of us went through that," said another classmate, Jim Creel. "But for him it was enhanced." School was a challenge, too. Mahomes finished second in his 22-person class in Lindale. But that was in a system that used hand-me-down textbooks from the white school – if there were textbooks at all. He arrived as an aerospace engineering major unprepared for the academic rigor of college. “Everyone seemed so much smarter than I was,” he said. Making matters worse, his roommate – who was also black – left the Corps after his first year, leaving Mahomes alone in his dorm room. No one else wanted to be his roommate. That first year on campus, Mahomes wasn’t sure he’d survive. But he worked hard not to become angry or confrontational. If someone shouted at him, he wouldn’t shout back. If someone made an off-color joke, he’d try to ignore it. The Corps helped, too. It was an organization where students’ differences are often ignored or concealed. Freshman cadets wore their uniforms to class and had their heads shaved. They even lost their first names – becoming known as “fish” instead. That close proximity forced classmates to get to know him, and eventually respect him. They saw him struggle to catch up in school and watched as he put up with extra attention. By the end of his freshman year, he began to see signs that he belonged. The most important moment came at an end-of-year party. One night, about 30 or 40 of the freshman cadets left campus for a celebratory dinner. Mahomes came along. But as they walked into the restaurant, the wait staff told the group that they wouldn’t serve Mahomes. “That was the day I really gained respect for my class, and really felt that we were making progress,” Mahomes said. Soon, Mahomes found new roommates and made more friends. His college career was never ideal, but it got better. With the help of tutors and other students, and a change in major, Mahomes caught up academically. And, like his classmates, his standing in the Corps improved as he progressed through school – relieving him of the push-ups and late-night runs. After four years, he was exhilarated to receive his degree. But when he left campus, a residual resentment lingered. He spoke with black classmates who weren’t in the Corps, hearing how life was tougher for them. And he was frustrated with the school’s reluctance to recruit and play black athletes. He didn’t hate his school – he just kept his distance. He earned his law degree at the University of Texas at Austin, and then a stint in the Army took him out of state. When he returned to Texas in 1979, he trekked back to A&M for a few football games and gave an occasional talk to black student groups. Meanwhile, the campus grew more open and diverse. Meanwhile, Mahomes built his law practice in Dallas into a major public finance and real estate firm that has worked with agencies like Dallas Area Rapid Transit and the Dallas/Fort Worth International Airport. Other Aggies from his era, like former Gov. Rick Perry and current A&M System Chancellor John Sharp, also gained prominence. The alumni network was strong, and Mahomes began to credit his school for much of his success. In recent years, Mahomes has been appointed to many boards for charities, business groups and cultural organizations. Perry appointed him to the Texas Youth Commission and the Texas Pension Review Board. But the call from Abbott asking him to serve his old school was a career highlight. Disclosure: Texas A&M University and the University of Texas at Austin are corporate sponsors of The Texas Tribune. A complete list of Tribune donors and sponsors can be viewed here. Decades After Racial Strife, Returning to A&M By Matthew Watkins June 14, 2015 Two decades after becoming the first black student at Texas A&M; to spend four years in the school's Corps of Cadets, Bill Mahomes received a call from an old classmate. They hadn’t spoken since graduation, but the man wanted to apologize. He had screamed at Mahomes once – not uncommon in A&M;’s massive, ROTC-like military program. But this instance had crossed the line. Words were too harsh. Racial slurs may have been used. The incident had weighed on the classmate ever since. &nbsp; Mahomes listened to the apology but didn’t know what to say. At first, he couldn’t even remember the incident. That kind of thing happened so often at A&M; in the 1960s that he usually endured it and moved on. The apology, however, left a more lasting impression. Looking back, the 68-year-old lawyer says, it was one of many healing moments that helped him reconnect with his university — a school he kept his distance from after graduating during the painful civil rights era. &nbsp; He began to be reminded of times of personal triumph and togetherness. And he came to realize that the strict rules and hard living of the A&M; Corps were responsible for much of his professional success. Now, 46 years after graduating, Mahomes is connected to the school in a way he never thought possible: He helps run it. This year, Gov. Greg Abbott appointed him to the A&M; System Board of Regents, a far cry from his difficult days on campus. “It has just been a dream,” Mahomes said. "Who Sent You Here?" It may have been naïve, but Mahomes showed up on the A&M; campus in 1965 thinking he'd have no problems. The university was in the middle of transforming from a small-town agricultural college to a major research institute. It was known for its rigid conservatism, but it didn’t have a reputation for civil rights strife. Mahomes had seen reports from across the south of universities resisting integration. But there had hardly been a peep out of A&M; when three black students enrolled in summer classes in 1963. A&M;’s military culture simply didn’t tolerate protests – for or against integration. That much was clear to Mahomes when he arrived. Early in his studies, a group of stern-faced upperclassmen pulled him into a dorm room and demanded to know which civil rights group he represented. “Who sent you here?” one student asked. Confused, Mahomes answered: “My parents.” The older cadets paused, and then one laughed. “If the civil rights folks were going to plant someone here at A&M;, they sure wouldn’t have picked [Mahomes],” the cadet said. That much was true. Prior to arriving at A&M;, Mahomes’ experience with racial tension was mostly systemic, not personal. He grew up in the small East Texas town of Lindale and attended segregated schools. There were restaurants where he couldn’t dine and parts of town he didn’t visit, but he almost never interacted with white people, so he rarely felt any resentment. “We didn’t know each other, so I didn’t feel animosity for people I didn’t know,” he said. “I wasn’t envious because I didn’t know what the other side was like.” Many of the white A&M; students in those years were in the same situation. “Unless you came from up north, pretty much all the students came from the segregated school system,” said Bill Youngkin, one of Mahomes’ classmates. Mahomes’ real reasons for picking A&M; were more practical than ideological. He liked that the Corps provided free uniforms, meaning his parents wouldn't have to spend their limited money on his clothes. And the school’s ballyhooed “core values” of “loyalty, integrity, excellence, leadership, respect and selfless service” reminded him of his time in the Boy Scouts. &nbsp; Another plus: There were hardly any girls at A&M. ; Mahomes was shy and spoke with a severe stutter, so women were a nerve-racking distraction he preferred to live without. The university had only begun accepting women in 1963, and few had taken the opportunity to enroll. Mahomes soon learned the same was true of black students. In 1965, there were only a handful in the Corps. He was the only one of that group to make it to his senior year. 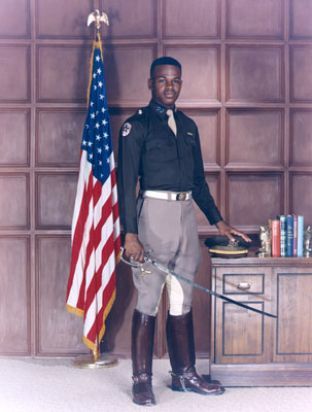 Enlarge Texas A&M; System Regent Bill Mahomes as a student in the 1960s. Tensions Flare Mahomes quickly realized how different his new home was. He heard students use racial slurs on campus. Occasionally, they were directed at him or other black students in a venomous way; more often they came up in casual conversation. Racial tensions periodically flared. During Mahomes’ freshman year, football coach Gene Stallings publicly refused to recruit black players, saying it would divide his team. Near the end of Mahomes’ senior year, a group of black students wrote an open letter to school president and World War II hero Earl Rudder, saying they felt “morally maimed and mentally tormented” on campus. The letter ended with a list of demands, including a counselor for black students and a more accurate representation of black people in history courses. The board of regents refused. Mahomes mostly avoided those conflicts. He was more focused on surviving the Corps. The tradition-laden group was close-knit, but tough on its younger members. That was especially true for Mahomes. Each freshman was required to memorize the names of all the Corps upperclassmen. If he forgot, he would be forced to endure physical tests. At night, freshmen could be wrestled from bed and ordered to run around campus or do push-ups in the mud. It was a struggle that all freshmen shared, but Mahomes got it worse. The best way to survive was to stay anonymous – and that was hard for a black student with a stutter. “All of us went through that," said another classmate, Jim Creel. "But for him it was enhanced." A New Respect School was a challenge, too. Mahomes finished second in his 22-person class in Lindale. But that was in a system that used hand-me-down textbooks from the white school – if there were textbooks at all. He arrived as an aerospace engineering major unprepared for the academic rigor of college. “Everyone seemed so much smarter than I was,” he said. Making matters worse, his roommate – who was also black – left the Corps after his first year, leaving Mahomes alone in his dorm room. No one else wanted to be his roommate. That first year on campus, Mahomes wasn’t sure he’d survive. But he worked hard not to become angry or confrontational. If someone shouted at him, he wouldn’t shout back. If someone made an off-color joke, he’d try to ignore it. “I didn’t treat people with disrespect, and I didn’t judge them from the basis of what they said,” Mahomes said. “I judged them from the basis of who I thought they were. I looked for the good in people. That came to be in my favor because people felt that they could trust me.” The Corps helped, too. It was an organization where students’ differences are often ignored or concealed. Freshman cadets wore their uniforms to class and had their heads shaved. They even lost their first names – becoming known as “fish” instead. Members were tough on each other, but were also expected to bond. Freshmen went to class together, marched together and ate two meals a day together. If one of them got in trouble, the whole group got in trouble. His classmates defended him from other students. And upperclassmen would berate freshmen if they harassed their fellow “fish.” That close proximity forced classmates to get to know him, and eventually respect him. They saw him struggle to catch up in school and watched as he put up with extra attention. By the end of his freshman year, he began to see signs that he belonged. The most important moment came at an end-of-year party. One night, about 30 or 40 of the freshman cadets left campus for a celebratory dinner. Mahomes came along. But as they walked into the restaurant, the wait staff told the group that they wouldn’t serve Mahomes. No one made a scene or gave a speech about equal rights. Instead, they all just stood up and left. As they walked out, one of the classmates joked to Mahomes, “We can’t take you anywhere.” “That was the day I really gained respect for my class, and really felt that we were making progress,” Mahomes said. Return to Campus Soon, Mahomes found new roommates and made more friends. His college career was never ideal, but it got better. “I learned to respect Aggies more because people said what they thought,” he said. “They didn’t try to sugarcoat or to hide things. It was an honest communication. It wasn’t always pleasant, but it was honest.” With the help of tutors and other students, and a change in major, Mahomes caught up academically. And, like his classmates, his standing in the Corps improved as he progressed through school – relieving him of the push-ups and late-night runs. After four years, he was exhilarated to receive his degree. But when he left campus, a residual resentment lingered. He spoke with black classmates who weren’t in the Corps, hearing how life was tougher for them. And he was frustrated with the school’s reluctance to recruit and play black athletes. He didn’t hate his school – he just kept his distance. He earned his law degree at the University of Texas at Austin, and then a stint in the Army took him out of state. When he returned to Texas in 1979, he trekked back to A&M; for a few football games and gave an occasional talk to black student groups. Meanwhile, the campus grew more open and diverse. Meanwhile, Mahomes built his law practice in Dallas into a major public finance and real estate firm that has worked with agencies like Dallas Area Rapid Transit and the Dallas/Fort Worth International Airport. Other Aggies from his era, like former Gov. Rick Perry and current A&M; System Chancellor John Sharp, also gained prominence. The alumni network was strong, and Mahomes began to credit his school for much of his success. “I am a better person for having been here,” he said. “I am the beneficiary of a great experience and a great education, not a victim.” In recent years, Mahomes has been appointed to many boards for charities, business groups and cultural organizations. Perry appointed him to the Texas Youth Commission and the Texas Pension Review Board. But the call from Abbott asking him to serve his old school was a career highlight. “I thought about my parents for a minute, just trying to imagine how my father would have felt,” he said. “He imagined great things for me. He imagined I would do good things in life. But I don’t think he could have imagined that I would have wound up on the board of regents of this school.” Disclosure: Texas A&M; University and the University of Texas at Austin are corporate sponsors of The Texas Tribune. A complete list of Tribune donors and sponsors can be viewed here. "Decades After Racial Strife, Returning to A&M" was first published at by The Texas Tribune, a nonprofit, nonpartisan media organization that informs Texans — and engages with them — about public policy, politics, government and statewide issues. Link back to the original article, which is located at https://www.texastribune.org/2015/06/14/45-years-ater-racial-strife-m-regent-returns-his-s/.